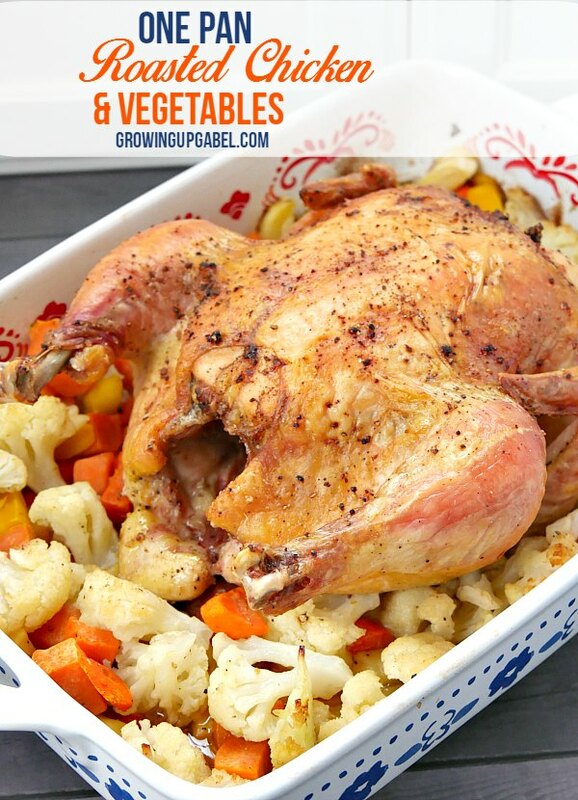 Throw this one pan baked chicken with vegetables in the oven and dinner is ready in about an hour. Use frozen vegetables to make this dinner recipe even easier. I've recently become interested in the idea of one pan recipes. I'm all for minimizing the amount of dishes I use to cook. If I can get both vegetables and a protein cooked at the same time and on the same pan, then sign me up! I decided to try this idea with a whole chicken and a few bags of frozen vegetables. I didn't want to have to spend time chopping up vegetables so I decided to see if frozen would work. I was a bit concerned that they'd get too mushy. I knew I would need some hardier vegetables. I threw in a bag of mixed root vegetables of sweet potatoes, carrots and parsnips. I added in another bag of cauliflower as well. Smaller and softer vegetables like green beans would probably overcook so stick with sturdier options. I tossed the veggies in olive oil and salt and pepper. I seasoned a whole chicken with salt, pepper, and garlic powder. Use whatever spices you like. Rosemary and paprika are also delicious on chicken. Rub the seasonings all over the skin of the chicken as well as in the cavity. Bake uncovered in a 400 degree oven for a little over an hour. Check with a meat thermometer in the thigh to make sure the bird is cooked thoroughly. When the chicken is done, remove the pan from the oven. Immediately put the chicken on a cutting board for carving. Remove the vegetables with a slotted spoon to a serving dish. Don't leave them sitting in the chicken juices for too long or they will get soggy. Serve the chicken with the veggies and spoon a little of the juices from the pan on top. That's it! Dinner is ready with little work from you. 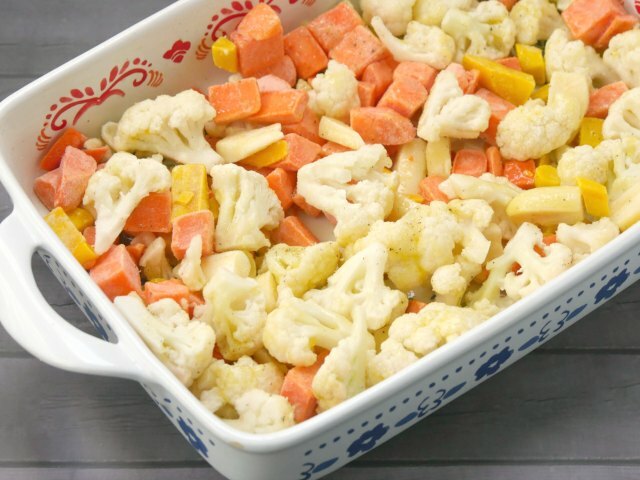 Put the frozen vegetables in a baking pan or casserole dish. Drizzle with olive oil and season with salt and pepper. Toss to coat. Use a paper towel dry off the chicken. Season as desired. I use a mix of salt, pepper, paprika, and garlic powder. You need about 2-3 teaspoons of seasoning. Put the seasoning all over the outside of the chicken as well as in the cavity and under the skin. 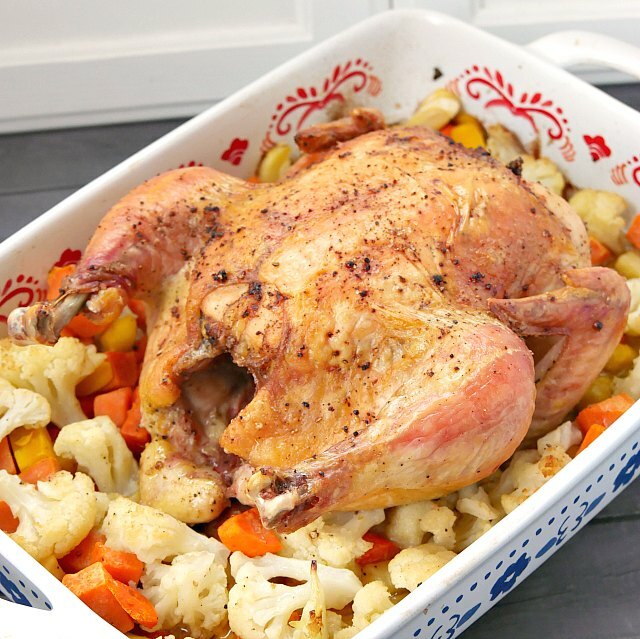 Place the chicken in the baking dish on top of the vegetables. 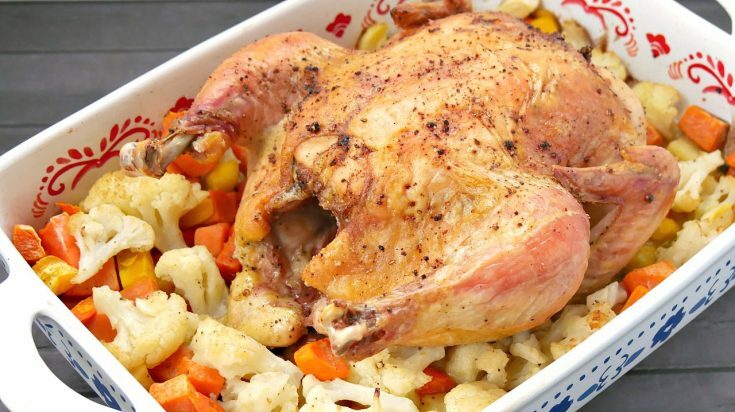 Roast the chicken for about an hour to an hour and 20 minutes. Check for doneness by sticking a meat thermometer in the thigh of the chicken. The chicken is done once the thermometer reaches 180 degrees. When the chicken is done, remove to a cutting board and cut for serving. Strain the vegetables out of the chicken fat and serve with the chicken. Just love doing chicken this way and I have to try cauliflower next time! 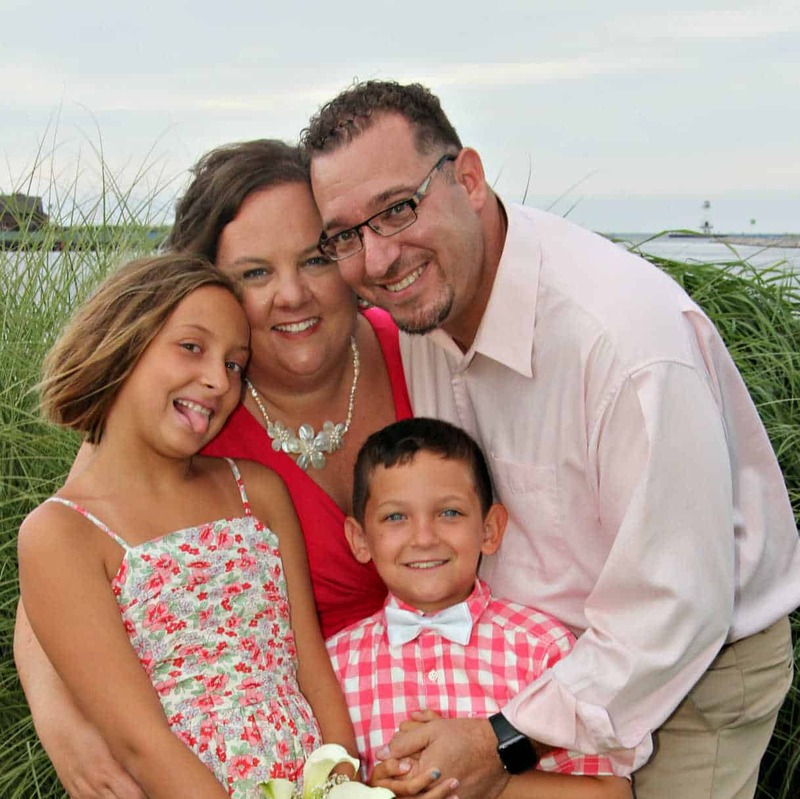 Thanks for linking up at Saucy Saturdays. Yum, what a hearty and delicious looking meal. My husband would go bonkers for this! Thank you for sharing with us at Throwback Thursday, this will be featured at tomorrows party! We hope to see you there. Yum! I just love a roast chicken. It has been far too long since I made one. I really need to do that too. I love the mix of veggies you have with it too. Nothing like a meat and veggies in one pan. Thanks for sharing at Throwback Thursday! Congrats on the feature! 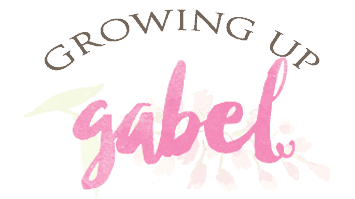 It is pinned to my Throwback Thursday Features and Favorites board! Looks yummy! Thanks for sharing at the Inspiration Spotlight party. Shared. Hope you had a great Easter! What a great weeknight recipe, love how simple it it but it looks utterly delicious and so budget-friendly! I love one pot meals. This looks amazing! 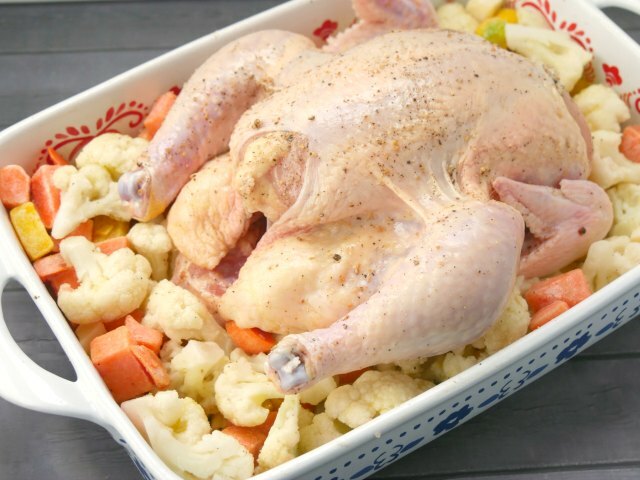 Good Afternoon Camille, Well, I had to smile when I visited Snickerdoodle Sunday and saw your one pan baked chicken recipe, because you never guess what, this is exactly what is roasting in my oven as I write to you. The only difference is I am using chicken portions. Great recipe. I usually make a whole chicken once a week and then divide up the meat into a few portions for soups and casseroles. I never thought of cooking the veggies right along with it. I will have to try your recipe. It looks yummy! I do that often, too! Onl we’ve graduate from one chicken to at least two. :-/ These kids just keep growing.